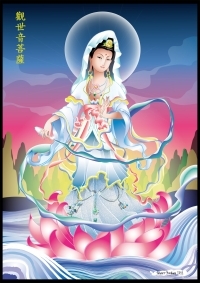 Guan Yin, the bodhisattva of compassion. Ronnie Laing was a Freudian to the extent that, like Freud, he was a deeply insightful and compassionate reader of people. He had the gift of unlocking the combination to the heart vault of virtually anyone and everyone with whom he came into contact. The experience of being “seen” by Ronnie was uncanny. You felt as if you were psychically stripped naked and made transparent. This left you no other possibility of being than to be yourself in his presence, no matter how clumsily you may have been in being able to manifest your “self” at any given moment in any given situation with him. Why was this experience of hanging out with Ronnie helpful in becoming a psychotherapist? Could it be that infinite compassion, the secret of Ronnie’s x-ray vision, is both the necessary and sufficient condition of practicing as a therapeutic agent? Let me give an example from my own practice. I see a young man who purports to speak in tongues, which has been freaking out his girlfriend and mother, and who believes he is called to be an evangelist. Recently, he spoke about regaling his Facebook friends by quoting Scripture in large numbers of posts on their pages, to the point where his “friends” unfriended him. From the moment my client began to speak, I could hear that his words were cut off from any connection to his heart. In other words, he was mouthing empty words. These words were the camouflage of a divided self, protecting an ontologically insecure 12-year-old (the age when his father died) who was inhabiting the body of a chronological 20-year-old. A second session brought out the fragmented, suffering, and entombed stream of consciousness of my client’s “true self” that was buried beneath his “false self” survival system. My client had seen that I saw his hidden self so he entrusted me with his fragile, wounded, and undeveloped being. His relief at allowing himself to be heard with compassion was palpable as he took a deep breath and relaxed. This was a moment of healing since for the first time he became present with me in the room as he bodied forth his true feeling at that moment. If I speak the tongues of mortals and angels, but have no love that makes me a trumpet blast or cymbal clash. And if I have the gift of prophecy and know all the mysteries and possess all knowledge, and have faith enough to move mountains, but have no love, I’m nothing. So can Laing’s compassionate reading of the other person be taught? Learning how to read another compassionately is something only you can do but you cannot do alone. Entering the zone and tuning to the music of compassionate relatedness happens in the presence of a guide with a compassionate ear and heart such as Laing’s. The cultivation of a good ear is at the heart of a genuine therapeutic apprenticeship. Today’s guest contributor, Steven Gans, is Associate Professor of Philosophy at American Public University and is in private psychotherapy practice at the Center for Relationality in Phoenix, AZ. He worked closely with R. D. Laing in the teaching and training of psychotherapists at the Philadelphia Association in London and is co-chair of the upcoming R. D. Laing Symposium.